If Indiana Jones has taught the world anything, it's that archaeologists go globetrotting to exotic locations to fight Nazis and crazed cult leaders with a whip. Okay, so maybe archaeology is more about carefully digging in large piles of dirt to find buried remnants of extinct cultures, but taking down the bad guys with a whip while doing it sounds like a lot of fun. We like to think that the seemingly quiet profession is actually quite mysterious and exciting behind the scenes. And if you are going to go into those situations anyway, you may as well have the education to get you out of sticky situations, right? We also think that carrying a whip as your weapon of choice is quite cool. It’s a very understated choice, yet it has the capability of not only being a weapon to fight off the bad guys but can be a lifeline is some adventurous situations. This officially licensed Indiana Jones costume will get you that adventurous look you’ve been searching for, no archaeology degree required! 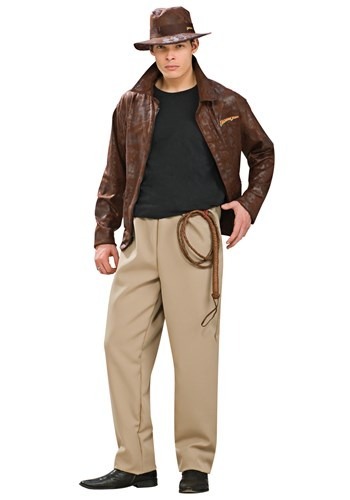 The costume starts with brown, faux-leather jacket that has a zip-up front. An Indiana Jones logo adorns the front of the jacket so no one will mistake who you are. A pair of elastic waist tan pants is also included for a complete look. Don’t forget about Indy’s signature fedora hat! Pick up a whip to complete this look that’s worthy of your next adventure!